Learning Design Thinking: Is it more like learning cycling or cycology? In the past few years I got opportunities to introduce Design Thinking subject to management faculty from various institutes. Some of these sessions were in teachers’ training programs held at IIM Bangalore, others were in the faculty development programs organized by institutes such as Christ University. One typical question that came up during these sessions is – How is DT different from what we are doing in Marketing, New Product Development or Operations Management? As a first step to explore whether there is indeed any difference, we can look at the following question: Are students learning the subject more like cycling or cycology? Let’s look at this question in this article. To appreciate the difference, you may want to try drawing a bicycle. It turns out most people can’t get it right the first time (Here is a paper on science of cycology that shows it experimentally). But the main point here is not whether you can draw a cycle correctly. It is that your ability to draw a cycle correctly is independent of your ability to cycle. You could learn to draw it well in a classroom and still not know how to cycle and vice versa. When you learn to cycle, it is sometimes referred to as experiential learning which Wikipedia translates as “learning through reflection on doing”. I feel learning DT is like learning both cycling and cycology with an emphasis on cycling. However, for many faculty members in India, teaching / learning happens as a study in classroom i.e. primarily cycology. There are at least three steps in DT where experiential learning gets emphasized. First is while learning to do immersive research. Students are expected to spend time outside the classroom and observe-interview-listen in the context they are studying. This could be a cafeteria, a classroom, a restaurant, a grocery shop or any context the team chooses to study. Second is when they are building prototypes. This is practiced in the classroom, in the lab / workshops with materials ranging from cardboard, play-dough to building physical models through woodwork, circuit boards, mobile apps etc. Third step where experiential learning is emphasized is when students test their prototypes with users and gather improvements areas. Sometimes user testing reveals not only a gap in the solution but also an incorrect assumption in the challenge statement itself. If all these elements are practiced through experiential learning in any course then DT may not offer new stuff. What are the “cycology” elements in DT? Well, there are a number of tools, methods and principles which one can learn. For example, it could be about the kind of questions to be asked during an interview, or about different ways of framing a challenge or about ways of prototyping etc. It also involves learning about various cognitive biases that distort our perception, framing and testing ability. 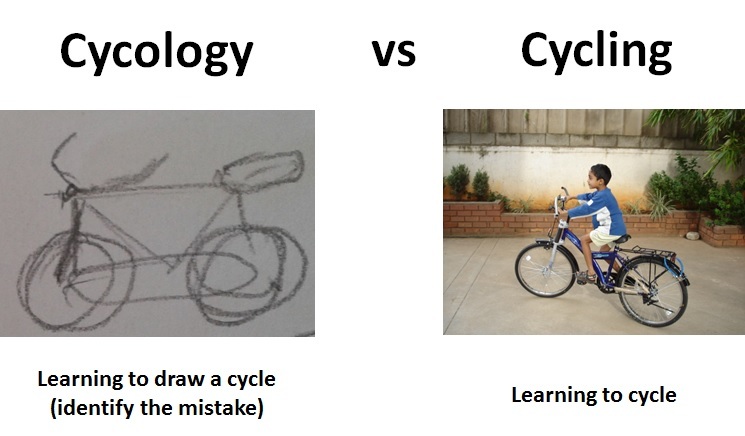 In short, learning DT involves practicing both cycling and cycology – i.e. practicing the design principles and learning-by-doing. Doing one without the other may not be sufficient.